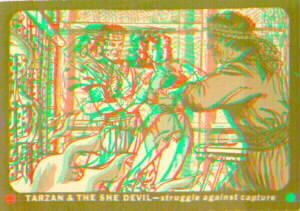 1950's 3-D. No special software needed !! HARRY HEPCAT TO THE RESCUE ! Hey, Kids ! 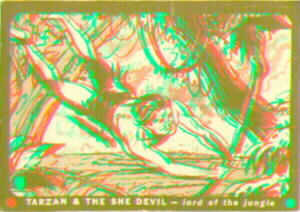 1950's 3-D glasses are easy to make. So, don't be left out if you don't have a pair. Just cut two holes in a piece of cardboard or a stiff piece of paper to cover your eyes. Oh! And, don't forget to cut out a spot for your nose. Put some red cellophane (plastic wrap) over the left hole and some blue (or green) cellophane over the right hole. Then stick your finger up your nose (I mean, put your glasses on). That's it! You're in business. Don't tell Sillycone Valley. USER MANUAL: Put on your 3-D glasses. Relax. Stare at the picture. Wait a couple of minutes for your eyes to adjust to the monitor. You may want to turn out any distracting overhead lights and adjust your distance away from the monitor. E-gad! This even works with an old browser. Great goo-ga moo-ga !! We don't need MicroSoft OR Netscape Explorer anymore!